Revolution 21's Blog for the People: 3 Chords & the Truth: This reminds me . . .
3 Chords & the Truth: This reminds me . . .
WBRH radio was where I got my start doing this kind of thing . . . with "this kind of thing" being 3 Chords & the Truth, the musical half of the Revolution 21 media empire. The FM voice of Baton Rouge High School has been around for nearly 33 years now. Without the training your Mighty Favog got there during the station's earliest days, the Big Show would be hugely nonexistent all these years later. THAT'S WHY it's so appropriate that one of the sets in today's episode is soooooooooooo quintessentially WBRH: The Rock 'n' Roll Days. It just is. If you're up for a bit of sport, see whether you can figure out which set. This should be easy if you're from Baton Rouge and go back a ways. 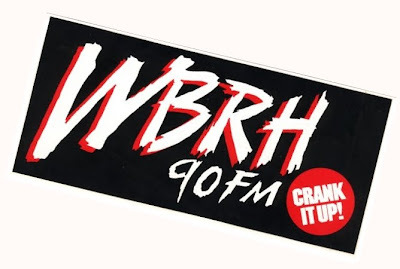 And if you're interested, you can read more about WBRH here. And here. And here. And here. didja know the WBRH bldg is about to be torn down? The new structure is oh so fancy, with a new media Today Show glass front. A modern Stone Age media? See no future, pay no rent. . . .
Give me liberty or give me . . . Thorazine! Oh, the weather inside is frightful. . . .
3 Chords & the Truth: Black & gold, baby! Find Uncle Lionel's bass drum! Ainnit true, Cap? Yeah, you right!